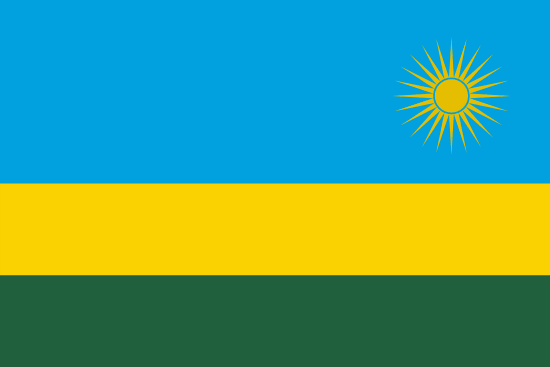 The flag of Rwanda is composed of three unequal horizontal stripes in blue, yellow and green colors. In the upper right corner of the flag, untraditionally positioned yellow sun is placed. The flag has been adopted in 2002 as a reminder of the genocide that took place in the last century and during which more than million members of tribe Tutsi was brutally murdered. The blue color on the flag designed by Rwandan artist Alphons Kirimobenecy represents peace, yellow color symbolizes hope for better tomorrows and the green color expresses prosperity of the country and its natural resources. The previous flag was originally identical with the flag of Guinea, thus Rwanda had been forced to add a capital letter R on its flag.